China's manufacturing Purchasing Managers' Index (PMI) strengthened for a third consecutive month in February, climbing to 49.0% from 45.3% the previous month. Li & Fung Research Centre reports that there were some encouraging signs: all sub-indices were higher than their respective levels in the previous month though many were still lower than the critical level of 50% (i.e. still contracting). In particular, both the Output Index and the New Orders Index rebounded to the expansionary zone of higher than 50% for the first time since September last year. In addition, the New Export Orders Index grew strongly by 9.7 percentage points to 43.4% in February, compared to the previous month. Some of the recent headlines from China Economic Net give an indication of the Beijing's strong emphasis on boosting growth. 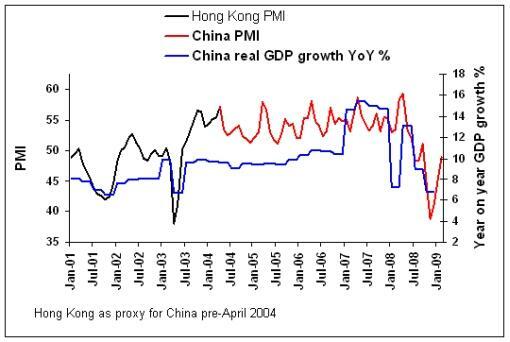 Let's focus on a few graphs in order to gain a better understanding of China's economic situation. 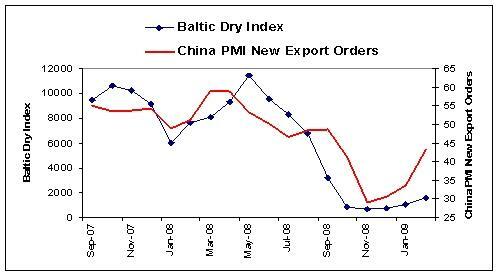 First up is the relationship between China's PMI for new orders and the Baltic Dry Index - measuring freight rates of iron ore and bulk goods - showing both indices turning up from last year's lows. 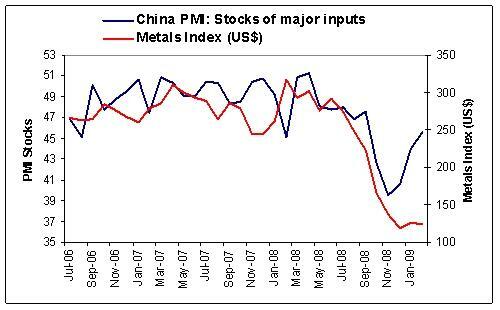 Next, China's PMI for stocks of major inputs shows the deterioration has probably bottomed and, based on the close relationship with the Metals Index, should put a floor under commodity prices. 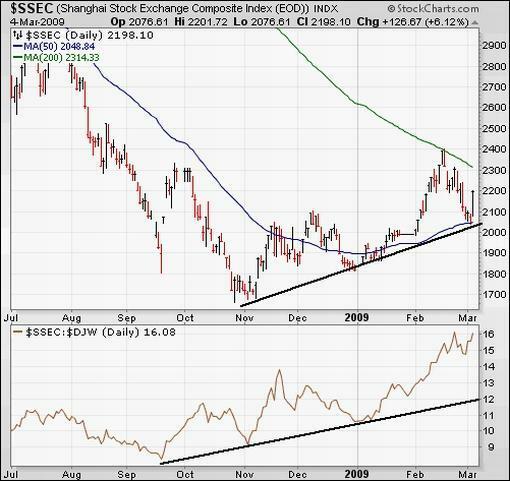 The Chinese Shanghai Composite Index is still down 63.9% from its high of October 2007, but has recovered strongly since its November 4 low (+27.8%) and is also the top performer for the year to date (+20.7%). As mentioned before, the chart pattern of the Index shows arguably one of the most bullish formations of the major stock market indices (see graph below). The chart (top section) shows a pattern of rising lows, supported by the four-month trend line and the 50-day moving average, with the 200-day moving average within sight. Also, Chinese stocks have outperformed the Dow Jones World Index by 87% over the past six months (see rising relative price-performance line in bottom section of chart) and the S&P 500 Index by a similar magnitude (not shown). The Chinese believe good and bad follow each other closely. It is therefore also comforting to learn that the Year of the Ox is a sign of prosperity and has been very rewarding in the history of China. Will China's command economy come to the Western world's rescue? 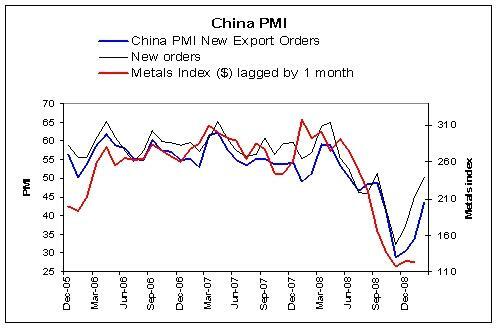 Time will tell, but there are rays of light, not least of which is a bullish-looking Chinese stock market. Copyright © 2009 by Prieur du Plessis - All rights reserved.